H. P. Blavatsky pointed to the fundamental concepts of The Secret Doctrine as comprising the principles of an ancient wisdom existing long before the dawn of history. 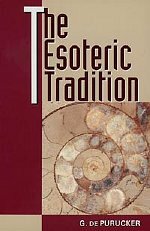 Underlying and seeding the world’s spiritual traditions, it is this doctrine and wisdom-teaching which G. de Purucker unfolds in The Esoteric Tradition. This new edition offers a broad, yet detailed introduction to theosophy, synthesizing philosophy, science, and religion in a way that enables the reader to see universes, worlds, humanity, and all nature as different aspects of one evolving cosmic pattern. And throughout the tapestry runs the thread of altruism and service as the way towards bettering all life. Topics include: what theosophy is and is not; the origin and structure of the universe; karma and reincarnation; cycles of human evolution; processes of death and rebirth; good and evil; divinity and the Hierararchy of Compassion; avatars, buddhas, and christs; mediums vs. mediators; the esoteric schools and the great teachers of mankind — these and much more contribute to the panorama of The Esoteric Tradition.